To finish our year of 6 inch (finished size) blocks. we will be making string blocks from quilter’s choice of fabrics and a few guidelines for the blocks to keep things interesting. Guidelines and directions for making the block appear below in this post. Add the tag string to all your blog posts about this block. 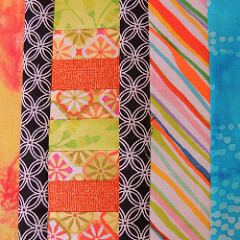 This block comes with my usual year-end suggestion that you use scraps from whatever project(s) you have been working on lately. Anything goes … as long as it’s quilting cotton. Each block must be made from at least 4 different fabrics of your choice. If you make multiple blocks, you may use the same fabrics multiple times, but each block should be unique – no twins! Each block must have at least 5 strings and no more than 8 strings. One or more of the strings must be pieced (with at least three pieces in the string). 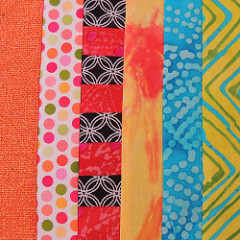 My blocks each have one pieced string, but you could decide to have more. The orientation of the strings should be more-or-less parallel with the sides of the block. It is your choice is you make a carefully measured block or something a bit more liberated. For the block above, I didn’t measure and cut all the strips with scissors, making them purposely uneven. I started with making the pieced string. You could make one string block and cut it into strips to use as strings in your blocks, or you could make them one pieced string at a time. For my first block, I sewed together two strips that were 1 1/4 inch wide. 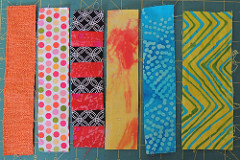 After sewing these together along the long edge, I pressed the seam and then cut four 1 1/2 inch squares from the sewn strip. I arranged the squares so that the fabrics alternated and sewed them together to form a string that was 1 1/2 by 6 1/2 inches. 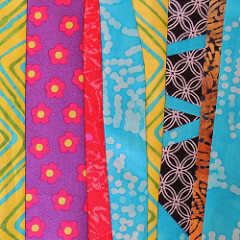 I combined my pieced strip with 5 more strips, also cut 1 1/2 inches wide. You’ll notice that the strip on the right is wider. I did this as a precaution in case my seams were a little bigger than 1/4 inch and the the block came up short. When sewn together, pressed and trimmed to a 6 1/2 inch square, it looks like this. Your strings can be thin or thick or a combination of both. make these 2 blocks a half-inch larger (7 inches) so that when you use them as half of a pieced Half-Square Triangle (HST), the resulting pieced block turns out the right size. Insert a strip along the diagonal for the barn’s roof edge. I will have more details and tips for completing your Old MacDonald’s Mystery Sampler quilt this weekend. Do you want us to make 6.5 inch blocks that finish at 6 inches in the quilt? Yes, I am sorry if that wasn’t clear and I went back to update the post. You should use strings that are at least 6 1/2 inches long and square up the blocks to 6 1/2 inches square for a 6 inch finished size (when sewn into a quilt) block. Thanks for asking so I could make it clearer. Woo hoo! These are right up my alley. I might just play along this month. I’ve got my fingers crossed for blocks larger than 6-inch for 2017. These look like fun! I may have to play along with this one.